Hannover, Germany, April 03, 2019 --(PR.com)-- Flexiv Ltd. today ushered in a new generation of industrial robot with the launch of its new robot, Rizon, at the annual Hannover Messe trade fair. Rizon is the world’s first adaptive robot combining direct force control with advanced AI, paving the way for greater performance and broader scope of robotic tasks across multiple industries including manufacturing, healthcare, retail and more. The adaptive robot has three distinctive traits that differentiate it from previous robots - great tolerance in position variance, high disturbance rejection and the intelligent transferability for quick redeployment between similar product lines or tasks. 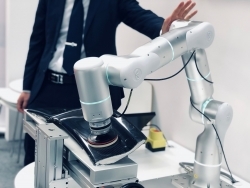 Flexiv integrates force control robotics with advanced AI to enable sophisticated perception, force-guided manipulation and flexible task planning with real-time adaptiveness that allows the robotic arm to work effectively in uncertain environments. Flexiv Rizon achieves the new level of adaptivity by custom joint design, self-developed control electronics, proprietary force sensing technology and hierarchical intelligence system. It also has industrial grade safety features ensured by the hardware architect and torque-based control framework for intrinsically safe interaction in uncertain environment. Offering unprecedented levels of adaptivity in robot design, Rizon can be programmed to perform a wide range of industrial tasks. These include polishing, parts assembling, precision insertion, force-based quality testing, etc. “Our robots are developed to have advanced manipulation skills to handle complex tasks in uncertain environments, which helps to provide flexible automation solutions for wider range of tasks in different industries,” says Shiquan Wang, co-founder and CEO of Flexiv. Using AI-based computer vision with depth camera, Rizon senses and recognizes objects even in complex environments, then generates its own motion and task plans. The integrated AI learning system enables the robot to not just learn individual tasks but actually combine them to perform more complex ones. It also drastically shortens setup and programming time. “It’s quite unusual to see a startup develop a robotic arm from scratch that has a precise force control system integrated with top-notch AI technologies. It can be applied to a whole range of industries such as automotive, 3C production, agriculture, and so on. Flexiv has a world-class team and huge market potential,” says Bin Yue, the founding partner of Gaorong Capital. Operators enjoy sizeable cost benefits not only from simplified setup and low downtime, but from labor cuts, smaller and simplified production lines, and the redundancy of safety measures without reducing work efficiency. The benefits are being clearly shown in proof-of-concept trials that the company is currently conducting with world-leading manufacturing firms as part of its Early Adopter Program (EAP). Through its EAP, Flexiv is attracting key industry customers offering customized solutions and first deployments of Rizon. Conventional robots were position-controlled, programmed to move from point A to point B but with no ability to limit the force they use to get there, requiring strict safety controls. The next generation robot, dubbed the “collaborative robot”, introduced force detection, leading us to a new era of human-robot collaboration. However, it is the third generation, adaptive robots, marked by forced control and advanced AI, that Flexiv seeks to dominate with a robotic arm that is more flexible, adaptive and intelligent across a broader task set than competing arms, and which expands the market for where and how robots are used in industrial applications. Flexiv is backed by top tier VCs. It has concluded a total funding of more than 22 million USD by GSR Ventures, Gaorong Capital, ZhenFund, M-Fund and Shunwei Capital. Flexiv Ltd. is a global leading robotics and AI company, focusing on developing and manufacturing adaptive robots which integrate force control, computer vision and AI technologies. Flexiv provides innovative turnkey solutions and services based on Flexiv robotic systems to customers in multiple industries. The company was founded in 2016, with a core founding team comprised of PhDs from robotics and AI laboratories at Stanford University. Please visit www.flexiv.com for more information. Click here to view the list of recent Press Releases from Flexiv Ltd.